Sun bathers, swimmers, surfers and surf life savers are the stars of a new travelling exhibition from the Australian National Maritime Museum, Waves & Water – Australian beach photography, set to open at the Bega Valley Regional Gallery on Friday December 9. Covering Australian beach culture from the 1930s to 2000, the exhibition includes 35 iconic photographs from seven leading Australian photographers, Max Dupain, Ray Leighton, Jeff Carter, Roger Scott, Ian Lever, Narelle Autio and Anne Zahalka. Offering differing perspectives of the Australian beach and the people who populate it, the exhibition provides a fascinating insight into beach culture. One of the most famous photographs featured in the exhibition is Max Dupain’s Sunbaker taken in 1937. Dupain’s photographs show his interest in light, sun, shadow, surf and the horizon lines of the beach while also focusing on the muscularity and athleticism of surf lifesavers and swimmers. Similarly Ray Leighton, who was immersed in Manly’s surfing community, produced memorable images of his friends surfing and hanging out at a time when long boards ruled the waves, including his classic Boys and their Boards taken in 1938 and Surf Sirens from 1946. The rise of surfing and subcultures at quintessential holiday sites such as the Gold Coast was one of the topics that independent photographer and author Jeff Carter studied during the 1960s on his surfing safari. His images, shot through a telephoto lens, capture the everyday lives and moments of regular beachgoers and surfers as illustrated in Tribal Gathering (1964). Underwater photography became the trademark of photojournalist Roger Scott during the 1970s. His images taken in the water were radically different and provided fresh, spontaneous and exuberant images of swimmers diving into the surf or doing handstands. The exhibition also includes Anna Zahalka’s more recent playful reinterpretations of classic beach photographs and paintings including Max Dupain’s Sunbaker. In these works Zahalka questions stereotypes and the role the beach plays in our national identity, interrogating traditional images of ‘bronzed Aussie’ lifesavers in her photos of pale skinned redheads and burqa-clad swimmers. Waves & Water opens at the Bega Valley Regional Gallery at 11am on Friday 9 December and will close on 3 February 2017. The Gallery will close on Christmas Eve and reopen on 4 January. 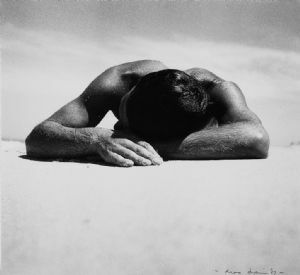 Photograph: Max Dupain, Sunbaker 1937. Silver gelatin photograph printed 1987. ANMM Collection.